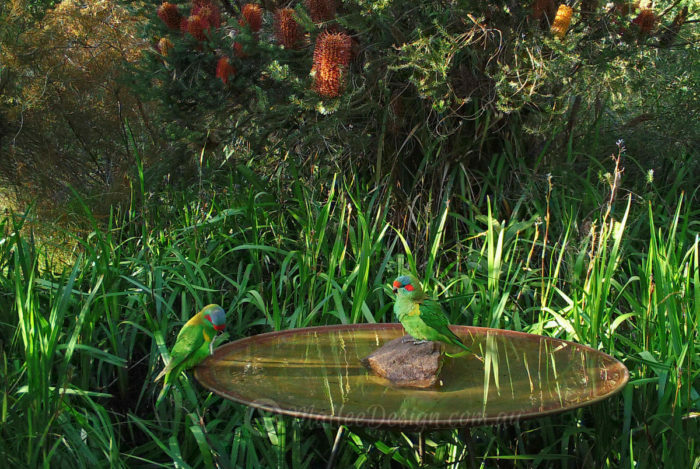 I have set up a small display of my spun copper birdbaths and water bowls in the beautiful native gardens at Sydney Wildflower Nursery : 9 Veno St, Heathcote, located in southern Sydney Ph 9548 2818. The bird baths may be purchased directly from the Sydney Wildflower Nursery, but they can also be purchased online and shipped to metropolitan centres all around Australia. You can visit the nursery all week, open 7 days from 9am to 5pm. Interested in the copper birdbath with sandstone plinth. Do you have an outlet in Queensland? Can we have price on delivery to Queensland or would like to arrange delivery. What is the diameter of the Large spun copper dish? The large spun copper dish is The dish is wide and shallow: 780mm wide x 50mm deep, it holds 12 litres of water. do you have an outlet in wa? or how much to freight the small one over? Thanks for the message, we ship the dishes to WA, all our prices on the website already include delivery. Hello, I have the medium dish with stand. What plants would you suggest that I grow around the dish, covering the stand, so the dish would appear to float amongst the foliage. The position is in partial shade and I have sandy soil. All of these species are very quick growing too! Hi Rosemary, I love your spun copper dishes nd would like to know if you have any outlets in Perth WA. Thanks for the message, we don’t have anyone stocking our copper dishes in Perth but we do ship to Perth. Hi Kath, can I arrange for a medium dish to be shipped to the Mid North Coast of NSW? HI Kath, I live quite nearby The Sydney Wildflower Nursery and love the beautiful display of bird baths there … can I buy directly from them or do I need to place an order? I live in Thirroul …so you may be closer ? Being a metal, does the birdbath get hot in summer?